In the main page, the headings hierarchy looks pretty good with one exception: as mentioned in #4112 the logo shouldn't be a h1. 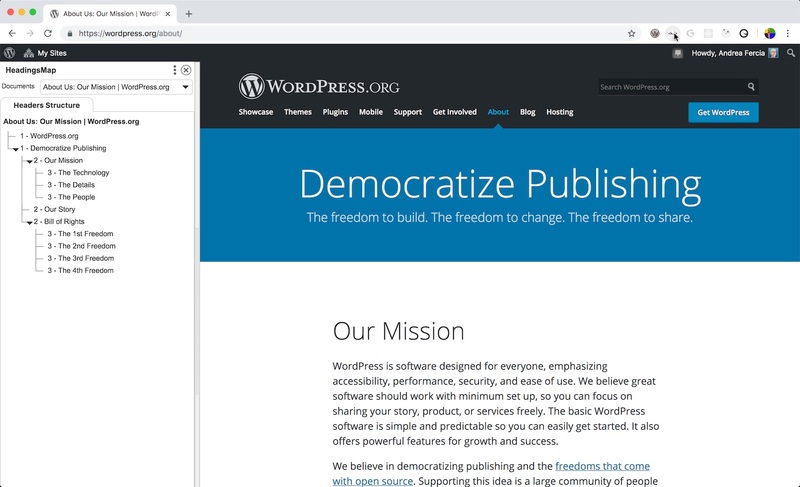 The main topic in this page is currently "Democratize Publishing" and that should be the only h1 in the page. Same in the sub-pages: there should be only one h1 and it should be the main title. The headings within the content are h3: they should be changed to h2. On ​https://wordpress.org/about/testimonials/ it would be nice to have a h2 heading before the list of embedded tweets to identify the section. In ​the statistics page, it would be nice to have headings before each graph section. Also, it would be great to have an alternative representation of the graphs in the form of data tables, but this is out of the scope of this ticket.